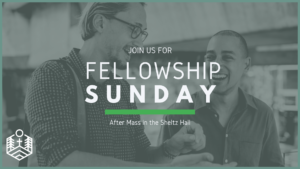 After all Masses, join us in the Sheltz Hall for some coffee, treats and learn about the various ministries and events going on in our Parish. If you would like to volunteer for Fellowship Sunday, contact Dcn. Mike Mort.